The Hopkinson Report » Episode 78: Interview – Jana Eggers, CEO of Spreadshirt talks Bacon, Ironman, and T-shirts. 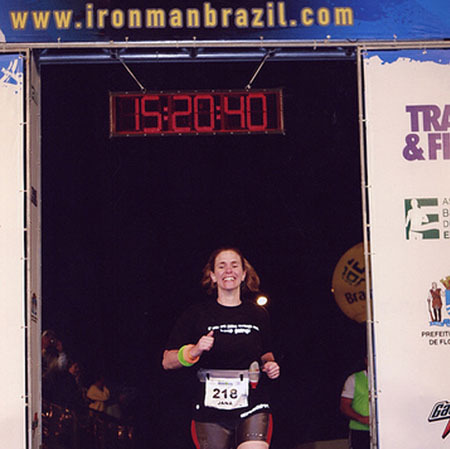 Episode 78: Interview – Jana Eggers, CEO of Spreadshirt talks Bacon, Ironman, and T-shirts. Has there ever been a better quote on the topic of longevity? This means one of my favorite weekend activities in New York City, going to long brunches with friends… savoring a hot cup of coffee… debating the eggs vs. pancakes vs. french toast conundrum… and without fail, ordering a side of delicious, crispy bacon, is actually helping me live a long and fulfilling life. 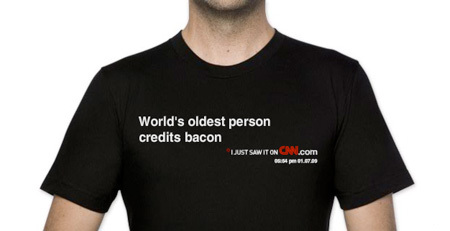 In an interview with the The Hopkinson Report (read the full transcript of the Spreadshirt interview here), Jana tells how a deal they’ve done with CNN allows users to instantly take any headline that CNN runs and make it into a t-shirt. (Buy the bacon shirt here).Â They’ve also done a similar deal with reddit.com. It’s just another way that users are getting customized, real-time products online. No longer do users need to watch network TV when they can make their own movies with a Flip Camera, iMovie, and YouTube. No longer do users need newspapers when they can write their own blog. And of course, your everyday marketing guy can create his own podcast for thousands to listen to. 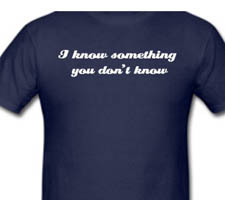 With Spreadshirt, users no longer have to order huge quantities and guess on sizing to get a custom t-shirt created. In fact, I’ve been using Spreadshirt long before I was introduced to Jana, having created a Hopkinson Report T-shirt back in March. 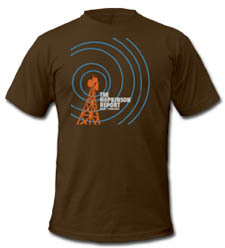 I did it to do a little promotion while I was at SXSW and have kept it low-key, but if any fans out there want a unique t-shirt, you can check it out at TheHopkinsonReport.com/Store. More than just the shirt itself, the great thing about it is that you can choose from several styles, from basic heavyweight T’s to American Apparel… from your standard cotton guy’s shirt, to the girly ones that have the little microsleeves… from long sleeve shirts to hoodies… in just about any color you want… and you can price it any way you want to. Jana describes herself as an entrepreneurial “super geek with a big propeller,” which is just the type of people we like at Wired. She’s worked from small startups to behemoths like American Airlines, and loves taking high tech work and applying it to something real and tangible. What type of group would be a shop partner? How about a knitting group that only knits PIRATE THEMES??? You need to listen to the podcast to believe it. Where does Jana get all the energy to run a global company? We talk about our shared love of fitness, although she completely raises the bar in that she has completed more than one Ironman Triathlon. So what’s the bottom line? Can a t-shirt really make a difference in your business? Well, in past jobs I’ve seen grown men fight over “League Champion” fantasy football shirts. I’ve seen employees making 6 figures and interns making next to nothing improve their motivation when getting some free swag. And c’mon, have you been to a sporting event when they fire free shirts out of a cannon? Please. She warns that you better be in the right mood when you put this shirt on, because EVERYONE will come up to you and start a conversation. Not good if you’re in the witness protection program, but if you’re an entrepreneur or small business trying to get the word out about a new product or marketing plan? You’re golden. In the podcast Jana explains why she originally created this, but it goes beyond that. Every business, every marketer is constantly recruiting… for employees, for customers, for ideas. Take the phrase and make it work for you. Read the full transcript of the Jana Eggers Spreadshirt interview. This entry was posted on Thursday, October 29th, 2009 at 6:04 am and is filed under Branding / Advertising, Interviews, Marketing Case Studies, Pop Culture / Entertainment. You can follow any responses to this entry through the RSS 2.0 feed. Both comments and pings are currently closed.